In my opinion, salad is delicious in all it’s forms (ok, except for those crazy grated carrot/raisin salads…not so much a fan of that salad variety, sorry to say). But sometimes it’s a challenge to find a salad that is delicious and filling enough to serve as a main dish for company or for a nice-ish family dinner. This remarkable salad absolutely fits the bill for a hearty, delicious, healthy salad that could easily be served to entertain with or to feed to your ravenous everyday dinner “guests” (a.k.a. children). My husband summed up this salad perfectly when he said it was the best salad he’d ever eaten because every bite offered something different. There is a lot going on in this salad and that is a good thing! 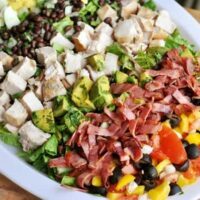 You’ve got your crisp, fresh romaine lettuce, but it is smothered in concoctions filled with yellow peppers, tomatoes, avocados, olives, bacon, hard-boiled eggs, and tender, flavorful chicken. It is downright amazing. I’ll admit, you use about 42 bowls to throw everything together, but it is well worth it, I promise. And don’t even get me started on the dressing. The name alone is worth making it. It is divine. Creamy, bright, fresh, full of fantastic herbs and flavors, this dressing complimented the southwestern flavors of the salad perfectly. Come to think of it, I might be willing to eat a helping of that carrot/raisin salad if I could slather this other-worldly dressing all over it. This really is a complete meal on it’s own, but throw in a Fruit Smoothie or some Fresh Fruit and Honey Yogurt Dip and you have yourself a healthy weeknight meal. For the chicken marinade, in a small bowl, combine the 1/4 cup lime juice, olive oil, soy sauce, 1/2 teaspoon cumin and red pepper flakes. Place the chicken breasts in a ziploc bag and pour the marinade over the chicken. Close the bag and refrigerate for at least an hour or up to overnight. Heat a grill to medium-high heat (an indoor grill pan or skillet could be used also). Grill the chicken until it is cooked through, about 5-7 minutes per side. Cool the chicken completely then cut into 1/2-inch pieces. Set aside. Place the eggs in a saucepan and cover with cold water. Bring the water to a rolling boil. Cover and remove from the heat. Let the eggs sit for 13 minutes then rinse them under cold water until they are completely cooled. Peel and coarsely chop the eggs. Set aside. Cook the bacon over medium heat until it is crisp. Drain on paper towels. When cool, crumble and set aside. In a medium bowl, combine the yellow pepper, tomato, olives, and 1/2 of the sweet onion. Season with salt and pepper and set aside. In another bowl, combine the black beans, 1/4 cup cilantro and onion. Drizzle with 1 tablespoon olive oil and season with salt and pepper. Set aside. In another bowl (don’t worry, we are almost done with the excess of bowls), combine the avocado, 1/4 cup cilantro, juice of 2 limes, cayenne pepper and 1/2 teaspoon cumin. Season with salt and pepper. Set aside. On a large platter (or large bowl), arrange the romaine lettuce. Arrange the chicken in a strip down the middle of the romaine. On either side, make piled strips of the eggs, bacon, yellow pepper mixture, black bean mixture and avocado mixture. Drizzle with dressing or serve it on the side. The easiest way to serve this on a platter is with a pair of tongs. If using a large bowl, gently toss to combine all the ingredients before serving. For the dressing, combine all the ingredients together in a blender. Process until smooth. Thin with additional buttermilk (adding it one teaspoon at a time), if desired. Store the dressing in an airtight container in the refrigerator for up to 3 days. This was the most delicious salad we’ve ever had! We will make this monthly for sure. Thanks for never failing me! I love everything I’ve made from your blog! This was a fabulous salad. Don’t be afraid of the long list of ingredients – each component comes together quickly. The green goddess dressing was so so good. I also added a minced clove of garlic to it and let the dressing rest in the refrigerator for a couple of hours. It made enough for two meals, but I wasn’t complaining. We will do this again many times. Thanks so much for an awesome dinner! This was sooooo good. Very time consuming but good! I had to make my chicken in the skillet and I added some corn kernels to the bean salsa and used turkey bacon. I paired this with your cornbread- which I used your suggestion of coconut oil in it (I used fat free buttermilk that I had leftover from this salad dressing). Amazing!! Loved loved loved this. Put all the toppings on the side so people could make their own individual Cobb salad since it was hard to evenly distribute everything from one big bowl. But I will be making it over and over! The works worth it 🙂 thank you. Oh and that BBQ chicken salad recipe you have is the bomb. Another wonderful salad we all love to death. Mel- I have been following and trying out recipes from your site and recommendjng them to my friends for the last year and my family is VERY happy about it. After making this salad with some cheesy biscuits last night my husband decided he loved not me, but YOU. 😉 But then he spent the rest of the night praising my cooking skills and randomly kissing my cheek, so Thanks for all the great recipes- coming back for more almost every day! Or every day I feel like cooking for my three chaoses ( children), that is. This looks sooooo yum!!!! Can’t wait to try!!! we LOVED- LOVED – LOVED!! Ate it 2 days in a row – and children ate lettuce . . . on purpose . . . for the first time ever. . . .enough said. Dressing is SO great! Just made this for dinner and my husband who looked suspicious in the making of it….but kept saying Mel never gets it wrong, stated this was his Favorite salad EVER! We are using leftovers for omelets in the morning and a taco buffet for dinner tomorrow! Awesome recipe Mel! I just got this recipe from a friend and made it with out the chicken for thanksgiving! It was awesome!!! Alot of people just ate this for dinner with the turkey on top. After the dressing turned out so great I tripled it and we used it all week! Thanks Its now my go to for family dinners! I have been making the original Martha Stewart version of this salad for years. I do simplify it a bit, by omitting the chicken and using honey smoked turkey breast, cut thickly at the deli counter, and then cubed. The original recipe just has a black bean salsa salad and no corn. I use half a jar of roasted red pepper, cut into bite sized pieces, as per her recipe. The real kicker in this recipe is the dressing which pull everything together. I highly recommend to use much more cilantro and flat leaf parsley to make a really green and great dressing. You’re right it can be used on so many things, even an an accompaniment to fish. Thanks for printing this, because the original is not to be found on her website. I just made this salad the other day and WOW!!!! This was amazing!!! My husband could not stop complimenting me on the dressing! Thanks, Charisse! So glad you and your husband loved this one. This was delicious! We loved loved loved it! And I guess I wouldn’t know what tasted different, but using miracle whip in the dressing worked great-it tasted wonderful! We will make this again and again! Thank you for this recipe, and the many many others we have loved as well! Thanks, Kira! I’m glad the miracle whip turned out a delicious dressing! This was a perfect summer dinner. It was kind of a lot of work for a salad–but worth it in the end! Dixie – Lana is one heck of a sister-in-law, that’s for sure. Glad you liked this. You know you can make it! You were the queen of multi-step meals in college (read: Cowboy Dinner). This isn’t that much harder, I promise. Kira – Miracle whip will definitely make this dressing more tangy. I’m not sure all the flavors will blend quite as well, but it’s worth a try if you prefer miracle whip over mayonnaise. Had this salad for dinner tonight and it was delicious! definately worth the work. Just put this on our next menu rotation. Can’t wait to eat it. We love fresh salads! How different will the dressing be if I use miracle whip instead of mayonnaise? Still as good as everyone is saying it is i hope? This was the BEST salad I have ever had. I loved every bite of it and so did my family and guests. Nicole – so glad you liked this! So far, I’ve made the dressing, and it rocks! Its like a fancy version of Ranch dressing to me, loved it! This salad was awesome! I just happened to have some leftover grilled chicken and decided to throw this salad together for dinner. I was worried that my kids wouldn’t eat a salad for dinner but I was wrong! They loved it and so did my husband. He said it was the best salad he had ever had. I think it was the green goddess dressing. I have never had it before and it was amazing. I had no fresh herbs on hand so I had to improvise with dried but it was still great. Thanks! Taryn – that’s high praise from your husband! I’m thrilled the salad went over so well with your family. I agree, the dressing is divine. Invited to a friend’s for grilled chicken last night — so I made this salad without the chicken as my dish to contribute, and it was a HUGE hit! Can’t wait to make it again….and again…and again! Susan – what a perfect side dish for a BBQ! This was AWESOME! Made enough for me and the Mr. for two nights…eating the leftovers tonight and it will be such a blessing to not have to COOK anything! Tanya – oh yes, having leftovers is the best! So glad this worked out well. I am definitely going to make this soon, although it looks like a TON of work for a salad. Holy cow a lot of salsas! Looks amazing… right up my alley. Thanks! I made this tonight and it is incredible! It was very filling, even for the male people I have to feed. I love the different salsas and the dressing, oh the dressing! I could eat cardboard as long as it was covered in that stuff. Good luck on your car ride. I’m afraid if I tried to drive that far with my kids one of us might not make it there alive. I hope you have a great vacation once you get there! 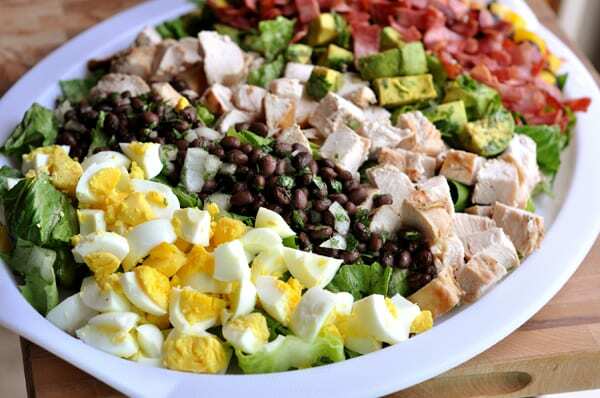 I just saw a recipe for Southwest Cobb Salad and wanted to try it out, but I know this one will be good! The other recipe I saw topped it all with Queso Fresco. I happen to have some leftover in the fridge, so I think I will try it. Okay so everything you make looks great, but that looks divine, can I come to dinner? Oh, this sounds mouth-watering! Bookmarked! Wow, what an ambitious concoction! I happen to love carrot/raisin salad – but, to each his/her own. One of the wonders of salad is how many different variations are possible. OMG, Mel! This looks absolutely amazing, and your photos are gorgeous! I love Southwest/Tex-Mex flavors, and salads of almost any kind (I totally agree about the carrot/raisin salad), so this would be a winner in my house. 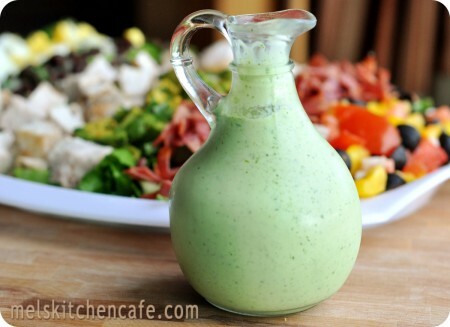 Like Jessica @How Sweet, I have never made home-made green goddess dressing, but have been wanting to try it. If you (and your husband) say it is the best salad you have ever eaten, that is good enough for me! 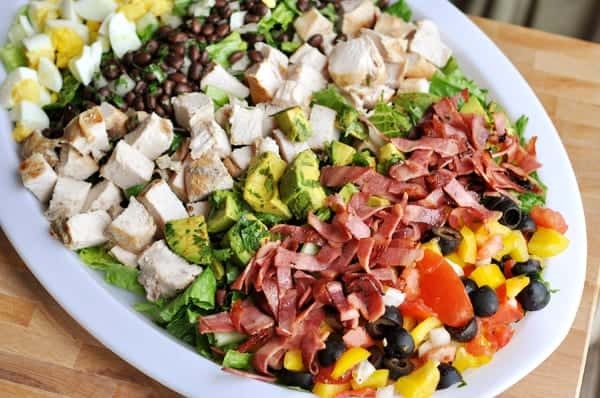 I will be making this salad for dinner this week…it is supposed to be over 100 degrees for most of the week here, and if I microwave the bacon and grill the chicken outside I won’t have to turn on my stove! 🙂 Thanks for sharing! I have never tried making my own goddess dressing – but I do love the Annie’s version! I am sure this is delicious!